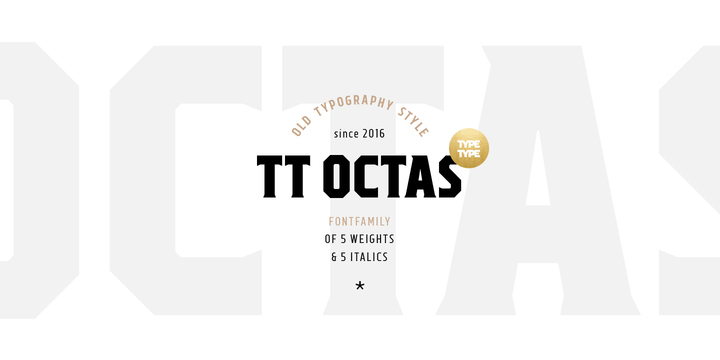 TT Octas is a sans serif typeface created by Ivan Gladkikh and published by Type Type which comes in an elegant and simple formula, 5 weights (from Thin to Black) and true matching italics, more than 400 glyphs for each typeface, useful OpenType Features and over 70 languages support. With a vintage touch is ideal for magazine, headline, text, logo and so on. TT Octas is great! A font description published on Tuesday, July 26th, 2016 in Fonts, Ivan Gladkikh, TypeType by Alexandra that has 2,278 views.